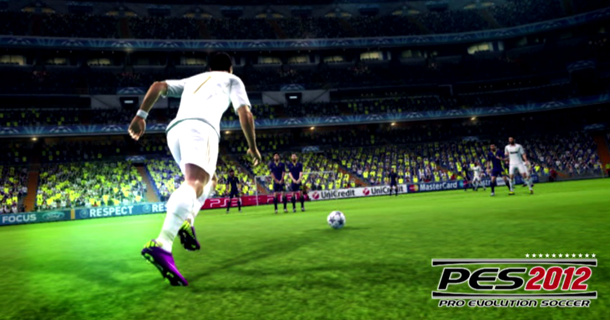 PES 2012 is coming soon! In the meantime, we have not one, but two versions of PES 2012 demo to pass our time. Please allow me to share my thoughts on these two versions. In the first version (DEMO1), you get to play with Man U, AC Milan, FC Porto, Napoli, Penarol and Santos FC. The new version (DEMO2) enables you to control Tottenham, Bayern Munich, Inter Milan, Rangers, Club America and Internacional. Definitely a wide choice of teams for us PES fans. A new version of PES gameplay, not sure if it is for the better or the worse. Initially will need some getting used to, no doubt about that. DEMO1 seems harder than DEMO2 for some reason, at least in my opinion. However, the new gameplay seems to allow more dribbling once you get the hang of it. It helps if your players are good too (I scored two solo goals with Rooney). Other than that, I find the new system pretty challenging. AI seem to get better in the second half, meaning that you may be able to score in the first half, but once you concede a goal, usually in the second half, they will go on a rampage and slaughter your team if you are not careful. Ferdinand has the ball, and the left back (Evra) is making a player run. PES 2012 seemed to be adopting the FIFA ‘Player Run’ system. Tilt your right analog stick in your teammates’ direction and press it, and the teammate will make a run forward. Apparently, you can also move your right analog stick to control your teammates’ move, though that will need some practice as well. The old system of pressing L1 + Pass, and Pass + R2, to make player runs, still works too. However, with the new player run system, I am not sure if it will affect the natural runs made by the AI in your team. The right analog stick also allows you to control your teammate during set pieces. You can now move your teammates around during a deadball situation, and press the lob button for the taker to send in the ball towards the player you control. This is also a little similar to the FIFA system used a few years ago. Not sure what KONAMI is up to. Hmm. Of course, the traditional system is still kept intact, and you can rotate between these two styles by flicking your right analog stick at the set piece taker, or your teammates. Similar free kick techniques in PES 2011 still applies to PES 2012, although the percentage of goals have decreased. I guess the AI of the keeper has increased (only for set pieces though). I managed to score a few free kicks myself. PES 2012 goalkeepers, especially in our teams, might give us a hard time. AI of keepers in open play seemed to have decreased drastically. Perhaps to mimic the real world blunders, keepers tend to spill easy shots directly into an opponents path. This happens often for most of the teams, at least in DEMO1. DEMO2 seemed fine (so far). Hope it remains this way. Defenders seem pretty dumb too, making several mistakes at the back during pressure, such as tripping over each other and scoring own goals. Mimicing the real world? Perhaps. On the fly gameplay strategies have decreased to a few important ones, such as CB Overlap and a few others. I guess they figured that the rest weren’t as popular so there is no point to include them anyway. Team strategy adjustments remain from 0 to 20. There are no new settings to be made, just that for certain strategies that you choose, your numerical settings will have a range. These ranges probably serve as a guide for you, and you can also remove the limits by choosing the ‘Standard’ strategy. Ratings of players are now broken down into more categories, giving managers more areas to consider before fielding a player or making a signing. Building a fast team on a budget? You may want to focus on purchasing players with high ratings in Speed. Thus far, the demo looks promising. Player run, if mastered, provides the potential for us players to execute some really slick attacking moves. The promotional video in DEMO2 also promises interesting Coach Mode and Club Boss mode, not sure whats the difference though, but we will find out real soon. Do share your comments on the demos if you have tried them out! Hey, love your blog dude! i have the pes 2012 2 days(not demo the o riginal)…it seems strange i can’t find an effective way to get me to goal plus i can’t defend well too…the positive is that players support you when you have the ball…any ideas about te way to get to goal and defending Neo…? Its fast that you have purchases PES 2012! The level of difficulty has been raised so it is much harder. Personally I have not bought it yet so I guess I can only provide helpful advice after my purchase, as the demo may not be a good reflection of the actual product. Sorry for that! How did you make those solo dribble runs? Do you press a button combo, did you hold on to speed burst? I get dispossed every time I attempted runs like that. I guess I was quite lucky on those occasions. For mazy runs, I release the sprint button and just used directional button to dribble around the defenders. I only use the sprint button once there is a clear path in front of me. I just picked up a copy 2 days ago. Started playing it immediately all weekend, but my excitement was short lived. Personally I feel PES 2011 was better, Konami made huge progress with last year’s edition but seem to have gone backward this year. Except for the improved AI and teammate control, the game seems very light compared to its predecessor. Settings are also less flexible and provides little choice to a gamer. The graphics are also not as good, lighting in gameplay makes it difficult to control your team with fluidity. I am highly disappointed and seriously considering swapping PES 2012 for a different new release that might give me better satisfaction and value for my money. Incidentally I decided to try FIFA12 this year as well. I as always a die hard PES fan but I have to admit that FIFA is better this year in the way it looks and the overall gaming experience. Hey, Zed I’ve been playing online and alot of these guys have been pressing everyone from my back 4 to my mid field I can’t make a pass without there being some sort of deflection. I’ve given up what seems like 100 counter goals because of this issue. How do I get my CF and SS to press like that ? Any help would be appreciated. Nevermind, I’ve figured it out. hi guys, just bought the game. dumb question: I can only move the players with the direction buttons on the pad (PS3), how can I assign the left stick to move the players? thanks in advance..